You are here: Home / Uncategorized / You might be a redneck if…. you blow up rubber gloves and convince your kids to color them like turkeys so they’ll stay out of your way whilst you’re making Thanksgiving dinner. We also may have cooked 2 turkeys for 10 people (6 adults). We wanted to try 2 new methods. #1 came from Martha and is called “spatchcocking” (yes, really). Click here if you want to check it out. It was delicious and super juicy. #2 came from a Costco impulse buy last year. We have an oil-less turkey fryer from Char-Broil. Also delicious, although it took a little longer than anticipated because our temperatures were below 40 degrees. I’d do both again. Enjoy the rest of your holiday weekend! 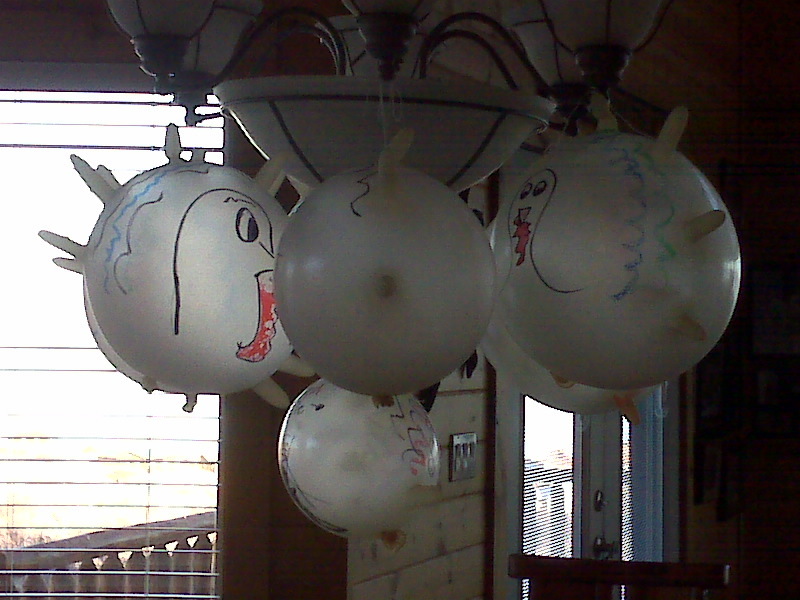 Oh the balloons crack me up! Love the balloons. Did you find your tylenol/motrin without going all the way to Lava? The word spatchcocking makes me giggle like a school girl. The technique seems pretty cool though. Is the bird more or less of a pain to carve when you prepare it that way vs the traditional non-spatchcocked (tee hee) way? I love cooking and eating turkey and have been designated the official turkey chef for the past too many years. I may have to try this next time we have a turkey. Great blog…you sure make a lot of cool crap. My Dad did all the carving, so I'm not sure on that. It seemed to carve quite easily, though. It was seriously the most juicy turkey I've ever eaten. And I LOVED that the whole thing was done in just over an hour. It's the 5 hours of roasting that keeps me from cooking a turkey…. LOVE the turkeys. Very clever! 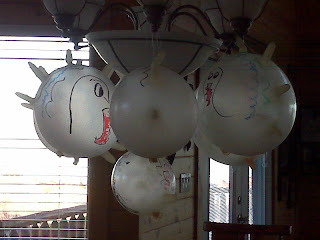 Why didn't I think of balloon turkeys? AND….I love that you call your daughter nerdy pants (last post). I can't believe how old and beautfiul she is getting.